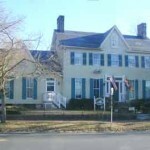 Although no longer in operation as an inn, the 1830s building is said to have a ghost known as J.J. He allegedly committed suicide by slitting his throat, but there are doubts as to whether this was truly what happened. Regardless, J.J. still resides at the place, according to reports. He appears as the apparition of a young man who goes about locking doors, blowing out candles, opening windows, turning lights off and on, setting off fire alarms, shaking guests’ beds, and lighting the fireplaces. He also has been known to appear in mirrors. I live there. I have stories, if you’d be willing to hear. Would love to hear your experiences. Visited the inn years ago and was given a tour and told some if the stories.